The beautiful Valerie over at Avec Valerie just nominated me for the Sunshine Blogger Award so I want to thank her for that. 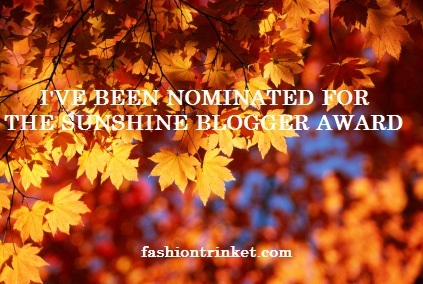 The purpose of the Sunshine Blogger Award is to spread love and happiness and so we can meet more bloggers! If you haven’t checked her blog out, please do so. She blogs about life, style, health and beauty so you will definitely find her blog posts interesting and exciting. 1.What’s one thing you love about the fall season? This sounds odd but I love Fall more than I do Summer. I love Fall fashion as out comes the cosy scarves and colours from the Autumnal palette. Wine, burgundy and navy all take centre stage. It’s not too cold nor too hot, so you don’t have to go overboard with the layering. You can still get away with wearing Summer trends with a blazer. 2.When you’re feeling down, what do you do to feel better? If I’m feeling down, the only way which is guaranteed to make me smile is of course either listening to or watching McFly. I’m not afraid to say that I have been pretty much obsessed with them for the past 13 years (yes it is all about Danny Jones!!) They’re music is guaranteed to lift your spirits. I have so many amazing memories of going to their gigs and have made some great friendships through them. I would have to say a bowl of Lucky Charms. You can only buy them here in the UK in specialist stores now so they do cost a lot more than your average cereal but boy are they amazing! 4.Where is your favorite place to be and why? I love the US and my favourite city is Las Vegas. It’s so fun and exciting! The bright lights, the noise of the casinos, American food and drink, and everyone having an amazing time makes it feel like you’ve entered another world. When I was at university studying fashion design, the Las Vegas lights and lucky 7’s inspired one of my collections. 5.What’s one thing that makes you happy? 6.If you could travel anywhere right now, where would you go? Mexico!! I’ve been twice now and each time I’ve had THE best vacation and break from everyday life. Chilling by the pool or beach in a cabana with a cocktail in hand… well you can’t beat that really. 7.What is one thing you love about yourself? 8.What is one thing you love about your blog? 10.Name 3 things you can’t live without? 11.What are you looking forward to this weekend? What book have you read recently and was it any good? What is your current go-to product? Those are my questions! I hope my nominees have fun with this. Once again, please check out Valerie’s bog, if you haven’t done so already. If I didn’t nominate you, please leave a comment and tell me about what makes you happy! Don’t forget to like and subscribe if you enjoy my posts.